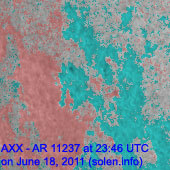 Last major update issued on June 20, 2011 at 04:40 UTC. 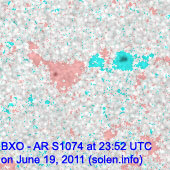 The geomagnetic field was quiet on June 19. 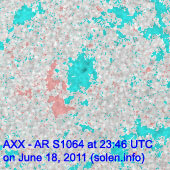 Solar wind speed ranged between 366 and 490 km/s. 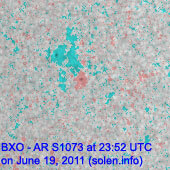 A low speed stream associated with CH458 began to influence the field early on June 20. 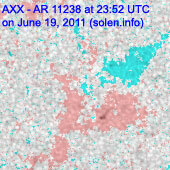 Solar flux measured at 20h UTC on 2.8 GHz was 99.1 (increasing 15.0 over the last solar rotation). 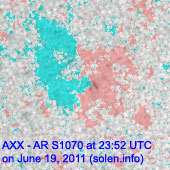 The planetary A index was 4 (STAR Ap - based on the mean of three hour interval ap indices: 4.0). 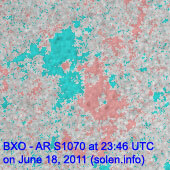 Three hour interval K indices: 10111111 (planetary), 10212222 (Boulder). 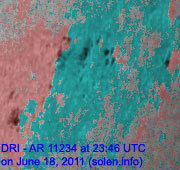 Region 11236 has minor polarity intermixing with spots spread out over a large area latitudinally and longitudinally. Region 11237 decayed early in the day and was spotless a few hours, then new tiny spots emerged. 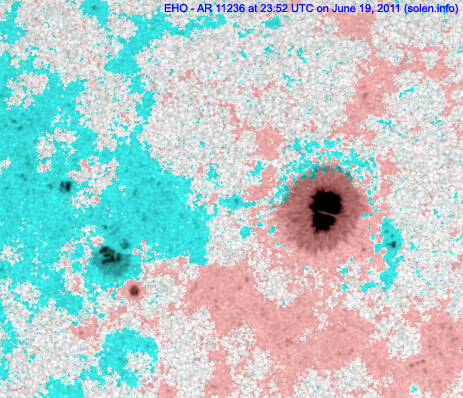 Flare: long duration C1.5 event peaking at 16:37 UTC. 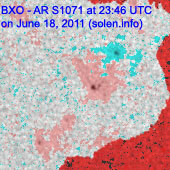 This event was associated with a CME observed off the east limb. 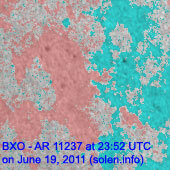 New region 11238 emerged in the southeast quadrant on June 18 and was numbered the next day by NOAA/SPWC. The region decayed slowly on June 19. 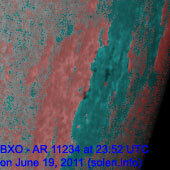 June 17-19: No obviously earth directed CMEs were observed. 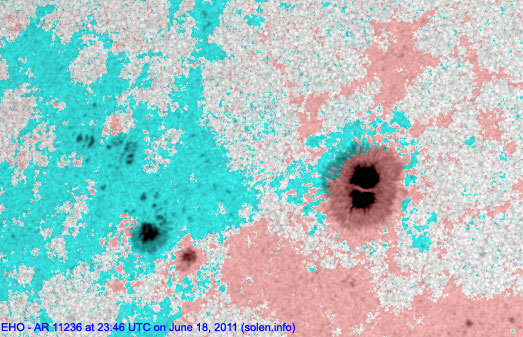 A recurrent coronal hole (CH457) in the southern hemisphere will be Earth facing on June 19-20. 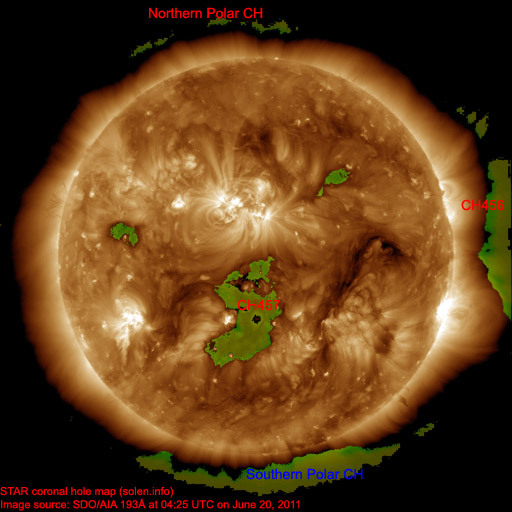 A coronal hole (CH458) in the southern hemisphere was Earth facing on June 16. 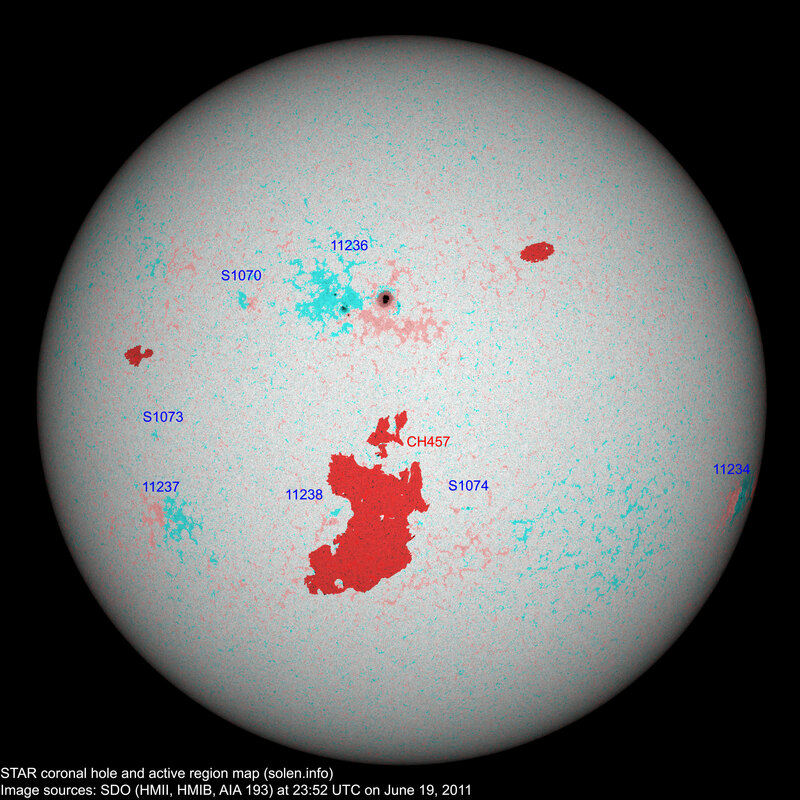 The geomagnetic field is expected to be quiet to unsettled on June 20 due to weak effects from CH458. 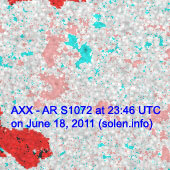 Quiet conditions are likely on June 21. Late on June 22 or early on June 23 a high speed stream from CH457 will likely reach Earth and cause unsettled to minor storm conditions until June 24.